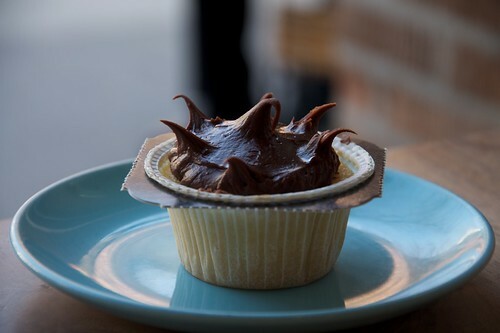 One Girl Cookies is one of my favorite places in all of Brooklyn and just happened to be next on my round of cupcake reviews! OGC seems to have it all: a soothing café, a dazzling array of sweets, quality coffee drinks, creative gift boxes, and transparency with their ingredients. Each time I go into the café, I’m impressed both with the space and with the staff’s friendliness. I’m always encouraged to take my time, and the employees are truly pleased when I like what I’ve eaten. 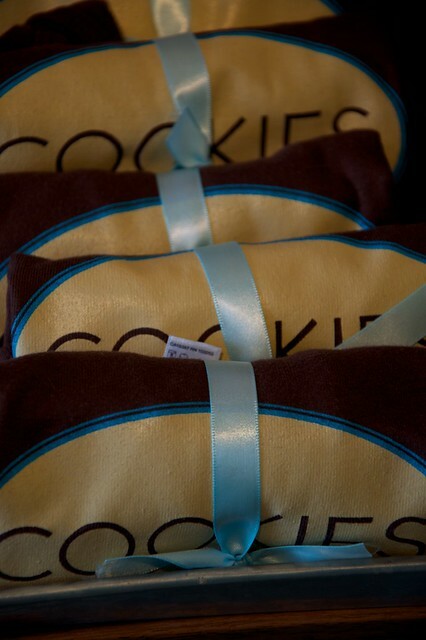 It’s apparent that One Girl Cookies prides themselves on the details and understands the importance of sourcing quality ingredients. I recently sat down with Dawn Casale, co-owner of One Girl Cookies to learn the story behind the shop. Dawn grew up baking and has many memories of cooking and eating with her family. The path of turning her passionate hobby into a business took several different turns and many years. While working as the women’s accessories manager at Barney’s New York, Casale started baking in her apartment in the West Village. She would bake all morning and then package and deliver her orders. Her roommate commented that she truly was a one-girl show, and the name ‘One Girl Cookies’ was born. After about two years of baking in her apartment, the orders grew too large to be efficiently baked in Dawn’s small apartment kitchen. Dawn then moved her operation to a caterers’ kitchen. Realizing that she would either need to go to culinary school or hire a professional baker to keep up with the demand, Dawn was introduced to David Crofton, who was attending The Institute of Culinary Education for a degree in Baking and Pastry Arts. 2005 was a monumental year for David and Dawn: they got married (and yes, they had a cookie bar at their wedding! ), and officially opened the One Girl Cookies store. 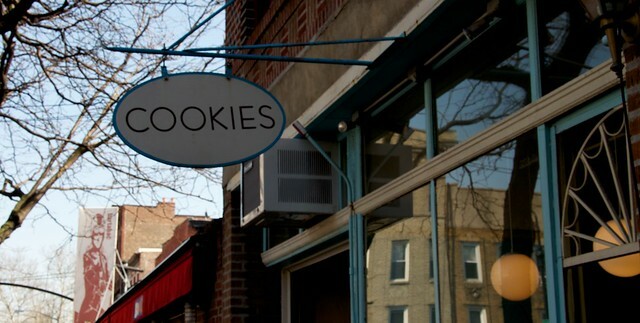 When asked why they chose Cobble Hill to be the home of their new shop, Dawn responded that they loved their neighborhood, and at that time, a bakery was a void that needed to be filled! 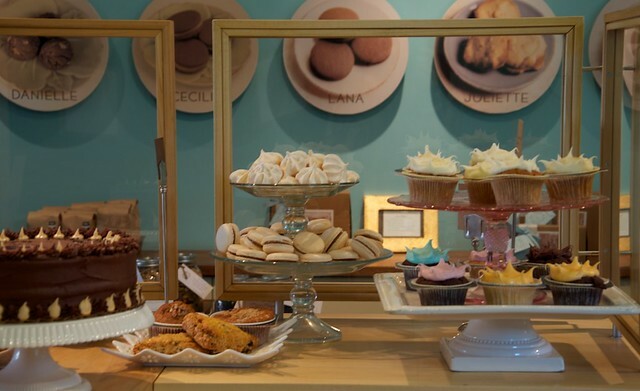 The One Girl Cookies’ cafe is whimsical and welcoming without falling into the trap of being kitschy or overly themed (“I hate kitschy!”, says Dawn). Before the store even opened, the elements were in place for the romantic, slightly retro feel. The boxes from One Girl Cookies’ existing delivery service had vintage family pictures as labels, and from there, Dawn and David were able to articulate what they wanted to their designers: a focus on family, and something soothing and romantic. These designs have manifested in a massive family tree on one wall, blown up old family pictures, soft blue paint, and a light-filled space. About two years ago, One Girl Cookies opened up the garage to be the fabulous semi-outdoor seating that it is now. I’ve often thought that the seating is the best part of the space: customers are directed to the counter, without having to dodge chairs and tables. 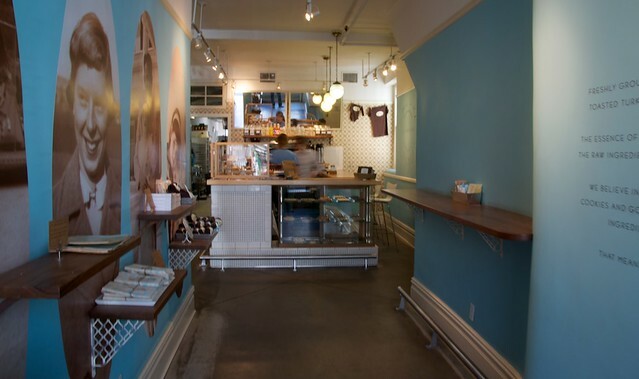 The customer can then choose to leave with their treats, or round the corner to the light filled galley space, perfect for quiet conversation. 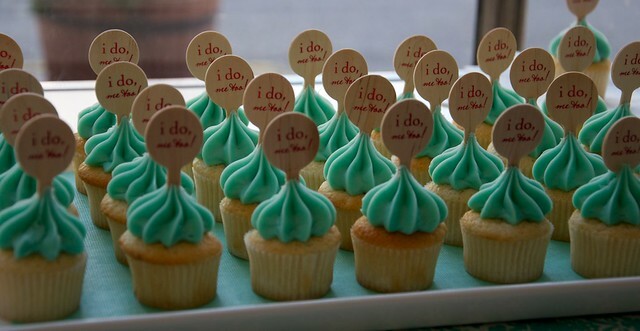 In addition to the store, the romantic theming and quality ingredients have been translated into a thriving wedding and event catering business. OGC works with each person or couple individually to customize exactly what they’re looking for. As an example, Dawn recently worked with a couple who have Sri Lankan and Australian heritage, but also wanted New York elements present in their cake and favors. 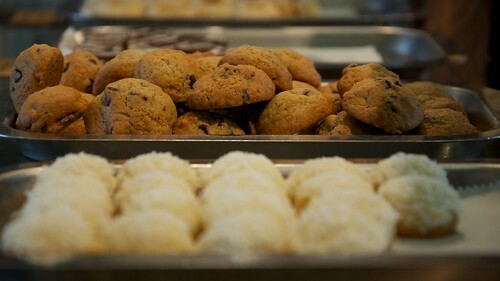 One Girl Cookies sources their ingredients through the Farm to Chef program (now known as Basis Foods). Through Basis, all of OGC’s dairy comes from Battenkill Creamery in Salem, NY. Moreover, when One Girl Cookies needs produce for pies or tarts, they order through Farm to Chef, knowing that quality ingredients will aid in creating quality products. Q: What is one of your top sellers? Q: Who else sells your products? Q: Your sweet goods are amazing, but you also make great coffee drinks. Do you see yourself as a coffee shop as well as a bakery? OGC: When we hire baristas, we tell them that OGC is a bakery first and foremost, but that we also pride ourselves on well-created coffee drinks. As Dawn shares, “If we’re going to do something, we’ll do it well”. Therefore each barista goes through the Stumptown Barista Training Program. Standard 1: Moist and Flavorful Cake: The cake wasn’t dry, but rather soft and satisfying. Unlike some cupcakes, this one didn’t fall apart upon my first bite. Standard 2: Fresh, Soft Frosting: The frosting is spiky and silly. It’s not only fresh, it’s quite rich. The spikes are naturally a bit firmer than the rest of the frosting, and overall, the frosting to cake ratio is well-balanced. Standard 3: Visually appealing: Who can resist the little spikes!? The display case was full of different combinations of spiky cupcakes. While the spikes are certainly not traditional, they are fun and unique. Oliver Strand wrote that these bottles look as if they belong in a "cooler on the porch". I hesitate to use the term 'bucket list' for fear of accidentally linking myself with Jack Nicholson, but with a week or so remaining in Brooklyn, I have no choice but to create a mini-list of things to see before we leave for the West Coast.